Renew and Rejuvenate your skin with this unique and highly effective moisterizing body butter formula. With an emphasis on the optimal mixture of natural oils, healing herbs, anti-oxidant Vitamins E and C on the basis of nutrient rich Dead Sea minerals. 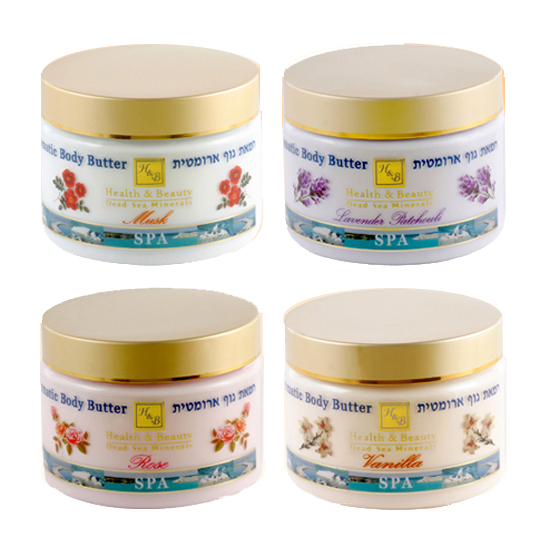 Highly recommended for use by pregnant women and those in the process of loosing weight, this concentrated, aromatic body butter improves the skins elasticity which aids in the prevention of stretch marks, and firms the skin texture and is especially effective around the neck area. A complete treatment for dry, scaley skin, this aromatic, moisterizing body butter by Health and Beauty Dead Sea Minerals is enriched with Omega 3 and 6, Shea butter, Aloe Vera Extract, Sea Buckthorn, Evening Primrose Oil and Green Tea. Its powerful anti-aging properties are enhanced by a tempting aroma that will sooth your senses as it firms & moisterizes your skin.